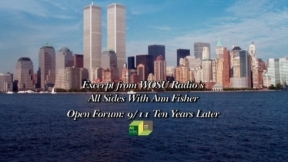 On September 9, 2011, WOSU Public Media's "All Sides With Ann Fisher" featured the topic "Open Forum: 9/11 Ten Years Later." Listeners called the show to tell their stories about where they were on 9/11/2001. This collection of videos, "Ohio Remembers 9/11," contains photo illustrations featuring the callers' stories. "All Sides with Ann Fisher" is a daily public-affairs talk show designed to - over time - touch upon all sides of the issues and events that shape life in central Ohio.